Pecan tassies are one of those quintissential Christmas cookies that remind me of being a kid. I can remember sitting at the dining room table at my great aunt’s house, usually on my mom’s lap, and hand-picking treats off of the multiple cookie trays that were laid out. 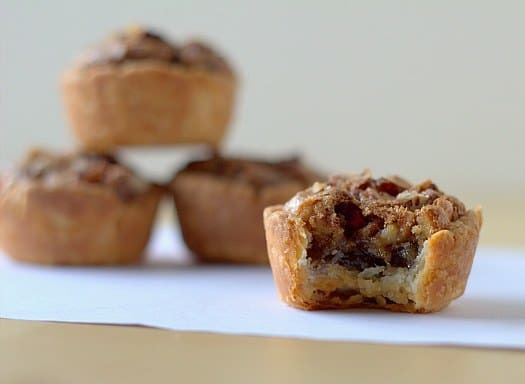 I always had my favorites, the ones I could pop in my mouth like candy, and these pecan tassies were at the top of the list. 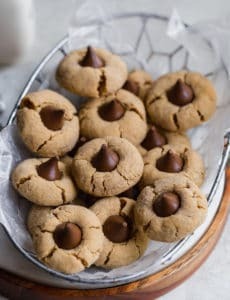 Even as a kid, I had love affair with pecan pie and so these cookies, which are bite-size renditions of the Thanksgiving classic, were always a must-have Christmas tradition for me. I haven’t made these in quite a few years and for some reason I couldn’t find my copy of our family recipe. My mom hunted through all of her index cards, calls were made to my grandma and my great aunt, and this quickly became the phantom recipe. The most beloved recipe and suddenly no one could find their copy of the recipe! Conspiracy! My mom did another search of her books and finally found the original source – a ladies auxiliary cookbook for a local fire hall dating back to 1975. I love those yellowed pages – tried and true, battle-tested recipes passed on from generation to generation. 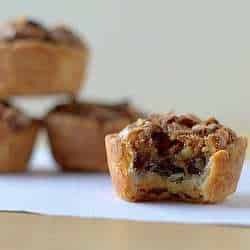 I have had more than a few people tell me that these are the best pecan tassies they have ever had. I did the first batch of these by just rolling the dough into balls and pressing into the mini muffin cups, which is what the original recipe says to do. I had some trouble getting the dough a decent way up the sides of the cups without making it too thin and too thick in places. So for my second batch, I tried rolling out each little ball into a circle and then popping them into the muffin cups (seen above). That worked out much, much better and made for a more even (and deeper) crust. It’s slightly more time consuming, but I thought it yielded much better results. I hope you love these cookies as much as our family does! Is there a certain cookie or treat that reminds you of the holidays as a child? Preheat the oven to 350 degrees F. Prepare mini muffin pans by greasing cups if it is not a nonstick pan; set aside. To make the dough, beat together the butter, cream cheese and flour on low speed of a stand or hand mixer until all of the flour is incorporated. Divide the dough into 48 pieces and roll into balls. Place on a plate or in a zip-top bag and refrigerate for about an hour. 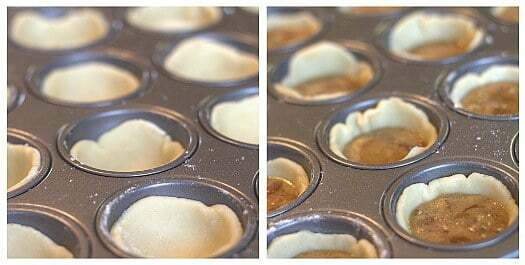 Either press the dough balls into the muffin cups and up the sides, or flatten the balls slightly with your palm and use a rolling pin to roll into a disk about 2-3 inches in diameter (a little larger than the size of the muffin cup opening) and place into the muffin cups. To make the filling, mix together the brown sugar, chopped pecans, eggs, melted butter and vanilla extra with a spoon and then evenly divide it between the dough-lined mini muffin cups. Top each with some additional chopped pecans. Bake for 20 to 25 minutes or until the tops are set. Cool for a few minutes in the muffin cups and then remove to a cooling rack to cool completely. The tassies can be stored in an airtight container at room temperature. My mother was no baker, but every Christmas one of her friends made two varieties of cookies just for ME, and I loved them both: Gum-drop bars (rather like blonde brownies, but with halved gumdrops [no black ones] folded in, and then the bars rolled in powdered sugar) and Springerle (a South-German specialty, flavored with anise and rolled out with a carved rolling pin that leaves a design in relief on each cookie). I’ve lived in Germany (the “Land of Super-Christmas” to me) and eaten many an elaborate holiday cookie, but these two types are what always remind me of my childhood Christmases and bring back special memories. I learned about pecan tassies in South Texas (lived/worked 25 years in San Antonio) where I had two pecan trees in my back yard. 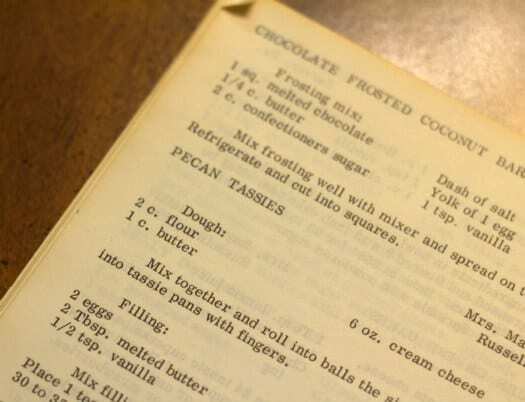 What I don’t understand is why corn syrup is omitted in a good many recipes for pecan tassies — it is certainly always an ingredient in full-sized pecan pies. You just saved me!! Was looking for something similar to a Derby Pie I make. I’m doing a taste testing, need 300. I think these will work!! I will drop a couple of Mini Chocolate morsels in each tin. (lessen the amount of pecans). Thank you!! Will let you know if they are excepted!! My co-worker brought these in. They tasted just like mini pecan pies. 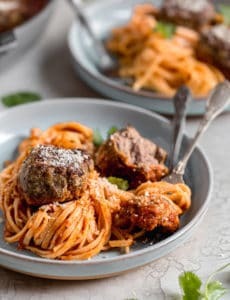 She sent me the link to this recipe and I made some tonight. They didn’t come out at all like hers. The taste is different and so is the texture. I followed the recipe exactly. I dont know what I did, but they dont taste like pecan pie at all. The filling was sort of thick when I mixed it up. Is it supposed to be? I had a lot of filling left over, too. Anyone else have this happen? I made this recipe and it came out great!!! I love it and will definitely make it again. I just wanted to say that I am really looking forward to making this recipe again this year, just as I do every year. This is the best recipe as the tassies always come out perfectly. Dough is so easy to work with. Thank you!! What size ball would you roll out to get 48? PS I do NOT rec’md using an electric hand beater. Did you? About 1-inch balls of dough. And I did use a hand mixer! I have that cookbook in front of me right now! I recognized it immediately. I was having trouble finding the recipe because mine is pretty beat up., so I thought I’d just google a recipe. I got the book from the Kidro , Ohio Womens Auxillary around 1978. I can’t tell you how excited I was to see this recipe. I bought a cookbook from a ladies’ auxiliary in the early ’70s that was from Cajun country in Louisiana. I used recipes, this one in particular, over and over and the book fell apart and the rest of it was lost in Hurricane Katrina. It is soooo easy to make and anyone who loves pecan pies will tell you that this is just like having your very own pecan pie. I have used this recipe for countless parties, weddings and baby showers, as well as at Christmas. In the Cajun cookbook, the recipe was known by its Acadian French name but the recipe is the exact same as the Pecan Tassies. I’m still on the hunt for the cookbook and know that I will come across it again. Thank you for posting this. It’s on my list for Christmas Eve. I haven’t made the recipe yet, but I am impressed to find another person who treasures the old, faded yellow pages of the recipe books our Moms and Grandmothers had! Love the little notations and ingredient adjustments, and the blotchy spots on the pages. Didn’t you love the recipe books that had pages you could snap out and pin on the cupboard so you could actually read it while baking? Happy memories. Thanks for sharing. I made these cookies from my Grams cookbook, the flavor was great but like you I just couldn’t get the crust right. Thank you for your changes in the recipe. I will make then again this weekend. 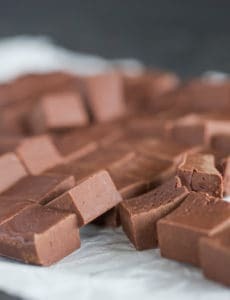 Could you make these with walnuts as well? I have been making these for years. I have a wooden gadget I bought from pampered chef party and Don’t know what I would do with out it. Roll each ball of dough and place in mini tins after you spray Pam first. With this gadget ,its a stick with a wooden ball on the end and all you do is press in the middle of each dough ball and it pushes the dough evenly up the sides perfect. Takes very little time. Hope this helps your readers. Make mine from regular pie crust. Also tool out larger ball of dough and cut small circle with rim of a water glass dipped in flour. Faster and cositacy of thickness on sides. I bought from Pampered Chef. You can also get them from e-bay. I make the balls and put them in the greased muffin tins and i have a glass of flour by the side and I dip the tamperer in the flour and then I smash the ball. Target has a Wilton 48 -cup tin. less tins to wash! I also put my syrup in a mustard or catchup bottle . I cut off the tips and it is much easier to pour into the molds. E-bay sells some that are pretty big. i forgot how many ounces but it holds a lot! I used this recipe for the first time, and the pecan tassies came out perfect. They are soft, and melt in your mouth.